Is there anything more romantic than a home cooked meal? We don’t think so! Valentine’s Day is fast approaching so why not show your loved one you care with three heart-warming courses, perfect for an evening in for two? The key ingredients featured in this blog post are available as part of our Valentine’s Dine-In Box for just £12.99! You can’t put a price on love but if you could, this would be a bargain! 1. Slice 3 chillies in half and remove seeds. Chop fine and add to a small pan along with the honey, and 1 tsp of lime juice. 2. 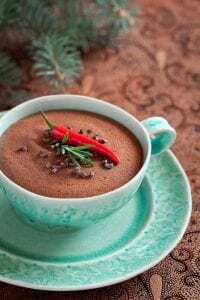 Place the pan on the hob and bring to a bubble, then turn the heat down low and let it foam for 4 minutes, stirring frequently before removing from the heat. 3. Arrange your lambs leaf on two plates, and pour as much oil over them as you want. Cut the remaining lime half into wedges and garnish plates. 4. Heat a frying pan on the hob. Add 8 halloumi slices when pan is hot and cook them for 30–60 seconds until they are golden brown underneath, turning them once to ensure they are the same colour on both sides. 5. 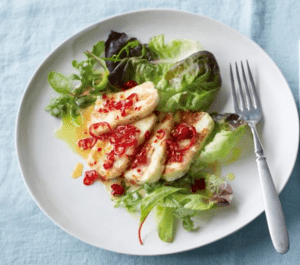 Add cooked halloumi to the salad plates, spoon over sweet chilli sauce, and serve immediately. 1. Heat the oil in a large pan over a medium heat. 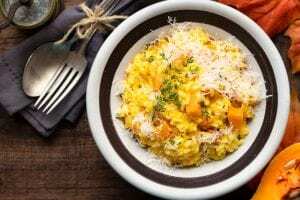 Slice onions and mushrooms, and cut butternut squash into small cubes. Add the onion to the pan and sauté for a few minutes. Add the mushrooms and butternut squash, cooking until tender and the mushrooms are slightly brown (about 6-8 minutes). 2. Stir in the rice and cook for 2 minutes. Turn up the heat and add the wine; it should sizzle as it hits the pan. Cook for a further 2 minutes to evaporate the alcohol. 3. Once the liquid has reduced, begin adding the hot stock a ladleful at a time over a medium heat. Allowing each ladleful to be absorbed before adding the next, and stir continuously. The rice should always be moist but not swimming in liquid. This step should take about 20 minutes. 4. Meanwhile, fry the chorizo in a pan over medium heat. When the risotto is done, remove it from the heat and stir in the chorizo and the cold butter. Garnish with parmesan, season to taste, then serve. 1. Combine both avocados and 1 tsp of fresh chilli in a blender or food processor. Alternatively, you can mash them together by hand however this won’t be quite as smooth. 3. When ready, stir in honey to taste. 4. Separate into two of your fanciest bowls, garnish with fresh chilli (if you’re feeling brave) and serve! Why not take your chocolate mousse to the next level by adding a Berry Bundle for just £5.00? Includes strawberries, raspberries, and blueberries!